Now, at least 800,000 have left their homes. That's nearly one in every three people in Lebanon. Aid workers from Medicins Sans Frontiers say the 'aid corridor' Israel has promised not to bomb in Lebanon is an illusion. Israel promised to allow aid workers to have access to people who are dying in the South, because Israel has rejected a ceasefire. But now, MSF aid workers say bombs have landed too close to them for 2 days in a row for them to get access. Even worse - they say Israel has just promised the aid corridor to make itself look good, without actually opening up a safe zone. Israel's humanitarian policy: kill UN peacekeepers, scare aid workers. Israel has withdrawn from Bint Jbail, after suffering heavy losses. They have been trying to occupy the Lebanese town for a week, but many Israeli soldiers have died, and dozens more have been injured. It's a humiliating loss for Israel, which now holds just a handful of Lebanese village. More than 600 dead - including at least 200 children, according to the UN. 2 Indian UN peacekeepers have been seriously injured. It comes just days after Israel killed 4 UN staff. The UN has begged Israel to stop attacking Lebanon for just three days, to allow them to deliver aid to the innocent. It's a step back from their regular requests for a permanent ceasefire which have fallen on deaf ears in Tel Aviv and Washington. Israel says it has already provided safe routes in Lebanon for UN staff - we know what happened the last time Israel promised UN staff would be safe,. Sayid Hasan Nasrallah hasapparently left Beirut, to have talks with Iran's security chief Ali Larijani in Damascus. 600 dead - including up to 200 buried in the rubble of destroyed buildings, rotting in the summer heat. After dozens of conflicting reports, it has been revealed that Israel stillhasn't managed to capture the border town of Bint Jbeil. Israel says it is because Hizbollah have forced civilians to stay in the town "at gunpoint", and so Israel has to be very careful. Didn't stop them in the rest of the country. On a day when Israel has called up tens of thousands more troops, it seems like poor excuses for poor performance. 1967 - The West Bank, the Gaza Strip, Sinai, the Golan Heights and East Jerusalem in 6 days. 2006 - One and a half villages in 15 days. There are reports Israel has called up between 15,000 and 40,000 reservists to serve in Israel's war on Lebanon. The Lebanese antii-Syrian government has reacted with astonishment to Syria's statement that if Israeli troops approach the Syrian border, they will act. "Why haven't they intervened from the first day of the conflict?" asked Lebanese information Minister, Ghazi Aridi. Lebanon, of course, has refused to let ITS army fight, despite army bases being targeted by Israeli jets, and its cities pounded day after day for two weeks. A somewhat poetic title, I admit. Here's the story: UN Generals called the Israelis 10 times to warn them they were firing dangerously close to a UN post. Kofi Annan's office called the Israelis to warn them they were firing dangerously close to a UN post. But still they continued, despite Israel's promises to stop. By 7pm, 4 UN peacekeepers lay dead, many more were wounded, and others put their lives at risk to rescue them. Israel even refused to stop firing on the post when their colleagues tried to injure the wounded. Israel says Hizbollah's capture of 2 soldiers was a 'declaration of war'. Austria, Canada, China and Finland - the countries the dead UN soldiers came from - should consider yesterday's Israeli attack as a declaration of war on Austria, Canada, China and Finland. All of the Lebanon body count figures come from a range of sources. But how do we know who is a civilian or Hizbollah fighter? The figures come from international observers - Human Rights Watch, the Red Cross, the UN, as well as hospitals, doctors in the field, journalists and the government. Hizbollah rarely supply casualty figures. So how do we know the number of civilian vs Hizbollah deaths. When journalists and investigators find a body they have to decide whether a dead person is a fighter or a civilian. Sometimes that's easy - a woman with suitcases and three kids in a car driving away from the troubled area are almost certainly civilian deaths. Hizbollah have said they are not scared of admitting the number of fighters killed - in fact it suits them to inflate the proportion of fighters killed, to show it's them . At the start of the attacks, nearly every person killed was a civilian - now, the proportion of fighters has gone up. Thanks to Amwreck for his useful question, and for everyone who's been participating in the lively comments section. I think 'lively' is the polite way of describing it. 400 Lebanese killed (340 civilians, 60 fighters). 40 Israelis killed (18 civilians, 22 fighters). He says he's "shocked" at the "apparently deliberate targeting" of UN peacekeepers - an Israeli airstrike killed 4 of them yesterday. Israeli jets have launched an atack on a UN base killing 4 peacekeepers. The UN says they tried to attack it 20 times during the day, with shells landing nearby. And as the UN tried to rescue the wounded, they said the Israeli attacks continued. The US has promised blankets for the three-quarters of a million refugees in Lebanon, at the same time as speeding up shipments of weapons to Israel. Imad Moustapha, Syria's Ambassador to the US: "I don't know which cargo will reach the Middle East first, the blankets or the laser bombs (for Israel)." That enduring myth that Hizbollah are hiding with civilians has been put to bed by Human Rights watch, who have accused Israel of DELIBERATELY targeting civilians. More evidence of war crimes in Lebanon. "We've investigated the results of air campaigns in Kosovo, Afghanistan, and Iraq, and the pattern here is different. They're hitting civilians time and time again," investigator Peter Bouckaert said. "Just because the Israelis are using smart weapons doesn't mean they're hitting military targets ... The Israelis seem to make no discrimination between military and civilian targets." And they have been investigating bomb sites in Lebanon, as well as munitions in Israel, and Human Rights watch are certain Israel is using cluster bombs - banned under international law. "It appears that Syria's main concern is the investigation into the murder of the Lebanese prime minister, Rafiq Hariri. If Syria could be assured that the investigation does not continue, there are indications that Syria would be willing to be helpful on many issues, not just the release of Israeli soldiers." And he has also said that Hamas leaders in Damascus are the last obstacle to solving the Gaza crisis. He says Hamas leaders in Gaza are willing to release the Israeli soldier (Hamas haven't confirmed that), but Hamas leaders in Damascus aren't. So, Abbas blames Damascus for the problems in Lebanon AND Gaza. That's quite an achievement. Israel, by his reckoning, is just defending itself. Israel says it is aiming to occupy a massive chunk of south Lebanon, almost as large as the area it illegally occupied for 2 decades. It will be more than 6 miles wide, and they say they will stay there 'until an international force can be deployed'. That is unlikely to happen for months, given the international disagreement about what to do. Even more worrying is the amount of time it will take to occupy an area that large. So far, Israel has managed to hold on to just 2 villages. What they are planning is a massive occupation, with tens of thousands of soldiers, according to the Israeli military. That could take months to achieve at Israel's current speed...meaning thousands more dead Lebanese. Syrian Foreign Minister Faisal Mekdad: "It has been Syria's ongoing position that we are ready to have a dialogue with the United States." Syrian Cabinet Minister Amr Salem: Syria could "play an important role in Iraq" by mediating between Iran and the US. Syrian Cabinet Minister Amr Salem: Syria has "real hard knowledge" of Al-Qaeda positions in Lebanon and it is ready to share this information with the United States. That's Condoleeza Rice's new way of prolonging Israel's destruction of Lebanon. It's like saying, there will be no ceasefire until the fighting stops. A ceasefire is supposed to be a way in to negotiations and a solution of the roots of the problem. It's not a sweet that you can hand out to kids who behave well. Get back on the plane Rice. The US Secretary of State has made a surprise visit - surprise because she was worried about being killed - to Beirut. She landed in a heavily armed helicopter from Cyprus for talks with Lebanese PM Fouad Siniora where she finally changed US policy by calling for an urgent end to the fighting...as long as the conditions are right. (There has got to be a gentle westerly breeze, Fouad has to stand on his hands, and Condi's plate must have three and a half spoons of hoummous on it. Three and a HALF). 600,000 Lebanese are now refugees. About one in five of the population are now on the run. In a clear breach of international law Israeli Army Chief of Staff Dan Halutz has given orders for 10 multi-storey buildings to be destroyed in Beirut for every rocket Hizbollah fires at Israel. Armies are only allowed to hit targets with military value. Hitting CIVILIAN infrastructure for REVENGE is a war crime and opens up DAN HALUTZ to be tried for crimes against humanity. I hope you remember that name. UN humanitarian chief Jan Egeland has already warned Israel about their wanton destruction of Beirut: "This is destruction of block after block of mainly residential areas. I would say it seems to be an excessive use of force in an area with so many citizens." He said yesterday that was a war crime. An Israeli helicopter has been shot down as troops try to invade Lebanon. 5 soldiers killed. And now that Israeli troops have invaded the country, where is the Lebanese Army that the government promised us would defend the country? I've just received this from a British woman married to a man from Anjar. She is desperate for information about his family. If you have had any contact with the town, please leave a comment here, or click 'my profile' and you'll find a button to email me. She also wants to know how she can help - if you have any advice specific to Anjar, please let us know. Also, the person who left the message, could you email me too. I am a British woman living in Cyprus and married to an Armenian/Lebanese man. I am horrified at what is occurring in Lebanon having visited Lebanon with my husband and met his family and friends there - I have only ever heard them speak of peace at last. Unfortunately my husband will not speak much about his family or the current situation in Lebanon very much, and I am finding this very distressing as I feel I am more interested than he is. Can anyone offer an explanation of this cold hearted attitude because he is not normally like this. He says I don't understand war as he has lived through this situation all his life and that he deals with this differently from me, because I haven't experienced war first hand in my own country. I agree with him except I am frequently finding myself in tears looking at the details and photographs of dead children etc. I worry about his family and his mother who is not of good health. I know that he receives texts and telephone calls but am not aware what he is speaking because the conversation is in Arabic or Armenian and when the phone call is finished he says all is okay with them! How can that be? Can anyone please tell me if the people in Anjjar in Bekkaa is okay as I do know that's where most of his family live. I worry that they are cut off and cannot receive supplies but feel helpless as to what to do if I cannot gain much information from my husband. We struggle here in Cyprus to keep our head above water financially but this is nothing compared to my fears of them without, shelter, food and water etc. I want to do something for them if they need it and for others in a similar situation but how can I do this with limited finances and information. Has anyone any ideas of something I can do as I just cannot turn my thoughts away from this. I am sorry to have rambled on but all my feelings have poured out and arrived on this page. Israeli Prime Minister Ehud Olmert says he will allow an EU force in Lebanon. But controversially, he does not just want international peacekeepers at the Lebanon-Israel border, he wants to impose his will on the Lebanon-Syria border, something which Lebanon is almost certain to reject. The international force "will have to include control of the border crossings between Syria and Lebanon, deployment in south Lebanon and support for the Lebanese army," Olmert said. He has accused Iran of smuggling weapons to Hizbollah across the Syria-Lebanon frontier. "Syria and Spain are working to achieve a cease-fire, a prisoners' swap and to start a peace process as one package," Syrian Information Minister Mohsen Bilal. Becky Anderson 2100 top line on CNN: "Lebanese and Israeli civilians suffering similar circumstances this evening." 5 explosions heard in the last few minutes. UK Middle East Minister Kim Howells is visiting Lebanon: "I very much hope that the Americans understand what's happening to Lebanon," he said. "The destruction of the infrastructure, the death of so many children and so many people. These have not been surgical strikes." tactics that have been used. You know, if they're chasing Hezbollah, then go for Hezbollah. You don't go for the entire Lebanese nation." Is the US taking notice of Syria? Reports claim parts of the Bush government want to involve Syria to end the fighting between Israel and Lebanon. At this week's peace conference in Rome, the US is expected to ask Arab states (probably Saudi, Egypt and Jordan) to visit Damascus. Israeli soldiers have occupied the hilltop village of Maroun al-Ras. They attempted to take it earlier in the week, but suffered heavy casualties. Israeli officials think they can get away with at least another week of devastating attacks on Lebanon. They think the have the backing of the US. Syria's Information Minister Mohsen Bilal says Syria will join the war if Israel invades Lebanon and its troops approach Syria. "If Israel invades Lebanon over ground and comes near to us, Syria will not sit tight. She will join the conflict," he said. The invading army has warned civilians in 14 villages in south Lebanon to leave their homes or face the consequences. It raises fears of a wide-scale invasion. Thousands of southerners have continued to flee. The population in Lebanon's third city of Tyre has fallen from 175,000 to just 5000 as civilians flee for their lives. Israel's Defence Minister Amir Peretz says he prefers a NATO force to UN troops. He said they may allow them into southern Lebanon, but has given no timescale. A top UN official says Israel's attacks on Lebanon break international law. Jan Egeland, the UN emergency relief coordinator says the attacks on south Beirut particularly shocked her: "It is horrific. I did not know it was block after block of houses (being attacked)". The capital has been hit hard again. More targets in the south and east of the country too. LBC is reporting that one of its staff has been killed as Israel attacks Lebanon's infrastructure. An LBC transmitter was also destroyed, meaning a large chunk of the country near the capital can't receive the channel. LBC is the most widely watched network - and an essential source of information as Lebanese wait to see how close the bombings are coming. It has an almost entirely Christian staff, it is on the right-wing, and rabidly anti-Hizbollah. A mobile phone mast north of Beirut, in a Christian area, has also been destroyed. 345 dead - nearly all civilian. The Syrian bloggers statement against the agression on Lebanon has spread...Italian blogger Olfy started the trend, and now three Italian blogs tonight added the statement. Hopefully more will follow. Please let everyone know. Today, we are all Lebanese. Lebanon has been sentenced to death. On Wednesday 12 July, she was put in prison, and now she's being tortured. Israel's war is with Lebanon's civilians, not Hizbollah. Nearly every person killed has been a civilian. Power stations, bridges and petrol stations have been targeted. Israel has warned residents to get out of certain villages, but bombed roads make it difficult - and refugee convoys have been picked out for deadly air raids. And getting out of the country is impossible now too. The airport has been destroyed, the sea ports are blockaded, and the border posts and highways have been razed to the ground. Lebanon is held hostage to the angry Israeli war machine. And now more than ever, Syrians bloggers, just like every Syrian stand by her. Another generation of Lebanese will know nothing but war. We can't let this happen. Again. This post has been supported by the group of Syrian bloggers at Syria Planet. Please feel free to re-post this statement, and tell one of us, so we can all add your name to this list. Israeli troops are in four villages in South Lebanon. The invasion has begun. · Jiye power station, 20 miles south of Beirut, repeatedly hit; electricity generator hit in Sibline. · Electricity in Beirut said to be "feeble and flickering", with large areas cut off. · In south, electrical supply almost completely cut. Estimated total of 750,000 people without electricity. · Four gas stores hit; 17 fuel stores destroyed; 12 petrol stations bombed. Prices have rocketed sixfold in some cities, such as Tyre. · Treatment plant hit in Dair al-Zahrani, south of Sidon. · Two trucks with water drilling equipment destroyed in Ashrafiyeh, Beirut. · Of Lebanon's seven airports, Beirut airport out of action (runways damaged, fuel tanks destroyed), Qoleiaat in the north and Riyaq military airport in Bekaa severely damaged. All main civilian and military radar stations out of action. · Three main seaports - Beirut, Tripoli and Jamil Gemayel - hit. Maritime operations antenna hit in Tripoli; Beirut lighthouse out of action. · 38 main roads severely damaged from the air, including road to Damascus. · 55 bridges destroyed, mainly those running to southern Lebanon. · Two hospitals hit, one in Nabatiyeh and one in the southern suburbs of Beirut; at least one destroyed (Mayss al-Jabal). · Convoy of donated medical goods hit near Zahle. · Hizbullah's Al-Manar TV station in Beirut hit. · Liban Lait milk plant in Bekaa hit. · Tissue paper factory in Sidon attacked. · Paper mill in southern Beirut hit. · Medical supplies company in southern Beirut hit; grain silos hit at port. · Warehouse of Transmed company in Beirut caught fire; $10m losses. · Stores of Procter & Gamble products hit in Choueifat. · Stock market closed on Monday after falling 14%. · Banks limit withdrawals by panicked customers to $1,000. Central bank keeping currency stable, say dealers. Lebanon's Defence Minister Elias Murr says the Lebanese Army will fight the Israelis if they invade. He seems to have missed the fact that a thousand Israeli troops are already in Lebanon. Two British journalists were in West Beirut after finishing a report for GMTV when a mob surrounded their car, stole their keys and tried to force them out for over an hour. Hizbollah officials pulled them out and drove them to a safe house. The pair received a phone call and personal apology from Lebanese Prime Minister Fouad Siniora, before being taken to safety. Lebanese Prime Minister Fouad Siniora, an ally of the US, says the Israeli Air Force is targeting ambulances and medical supplies. And aid work can't reach those who need it becuase 55 bridges have been destroyed. "This attack is no longer against Hezbollah, it is an attack against the Lebanese and Lebanon," he said. 50,000 Lebanese have fled across the border into Syria, while the world concentrates on foreigners being shipped out of Beirut port by Navies. Another half-million Lebanese are refugees in their own country. They either don't have enough money to leave, or can't risk getting to the border because Israel is sending million dollar rockets into every vehicle heading to or from the border. Save Beirut is a new charity looking for homes for Lebanese refugees. They are appealing for money. Two helicopters have collided according to Israel. There are claims from Lebanon that an aircraft has been shot down. Lebanese Forces making a comeback? Michel Aoun has accused the Israeli Army of destroying radar towers in Tripoli so they can start smuggling weapons into Lebanon. Israel's targeting of the Lebanese Army bases which house the radar towers raised eyebrows. Now it has become clear those radar towers only patrol the coastal waters. And the Lebanese Forces militia - which are allied to Israel - are re-arming and training. U.S. Secretary of State Condoleezza Rice will not travel to the Middle East until next week. According to the UN, it is not just civilians bearing the brunt of the Israeli attacks on Lebanon, but children. The UN's Human Rights commissioner has warned Israel that its actions in Lebanon could be war crimes. "The bombardment of sites with alleged military significance, but resulting invariably in the killing of innocent civilians, is unjustifiable," said Louise Arbour. "I do believe that on the basis of evidence that is available in the public domain there are very serious concerns that the level of civilian casualties, the indiscriminate shelling of cities and so on, on their face raise sufficient questions that I think one must issue a sobering signal to those who are behind these initiatives to examine very closely their personal exposure." More Syrian Bloggers have addded their names to the statement below. Keep doing it. If you have a blog, post the statement and tell me, so we can all add your name to the list. The Syria News Wire is a pure news service - no comment. But I have been so distressed by the events in Lebanon that I felt the need to write the following. The Syrian Red Cresent is appealing for volunteers and donations to help the thousands of Lebanese refugees flooding into Syria. A number of schools and convents have opened in Damascus to provide shelter and care for the homeless Lebanese. If you can spare a few hours to help, call 011 9338 any time of day. Water, sanitation and medical supplies are running out for the half a million refugees in Lebanon according to internation relief agencies. They fled their homes after being ordered to leave by the Israeli army. Yesterday Israel destroyed a medical supplies van coming across the border. The day before, a house of rescue workers was targeted by Israeli jets. And today Israel has destroyed a Red Cross emergency relief centre. 300 dead. At least 55 civilians have died TODAY. ...in Al-Ansariya. This is verging on a war crime - Israel has maps of aid agency locations, so unless it was a mistake, Israel has carried out yet another unimaginable atrocity. ...in Israel's 'war on Hizbollah'. Maybe they learnt that Hizbollah has Christian voters and candidates too. The cobbled streets of Ashrafiyeh are the only surviving historic part of the city. Once again Israel has shown that it hasn't finished with Lebanon. 49 have been killed today. 12 died and 30 were wounded in Srifa - 10 were killed in the same family. Many more were killed across the south and in Baalbek in the east. Is this price worth paying Israel? Half a million people - that's one out of every six Lebanese - have become refugees according to the UN. In one valley in the Shouf mountains, 20,000 people are taking shelter in public buildings. A truck carrying medical supplies along the Beirut-Damascus highway has been hit - the driver was killed. The Guardian is quoting British sources which say Bush has given Israel one more week to do as much damage as it can to Lebanon. After that, the US will back calls for a ceasefire. Condoleeza Rice's visit to Lebanon and Israel has been delayed until the end of this week at the earliest. They claim that a prisoner swap is also on the cards, and that Israel is no longer demanding Hizbollah disarms before Israel stops bombing Lebanon - now, apparently, it is only calling for Hizbollah to move away from the border. Click here if you are in Italy - lots of demonstrations in support of Lebanon. The UN says that Lebanon is facing a humanitarian disaster. People are fleeing their homes, making it difficult for aid workers to get help to them. And the UN is struggling to get to areas cut off from food supplies, because Israel has bombed the bridges and roads. The Lebanese Army has been ordered not to fight the Israelis. They are not allowed to shoot at planes attacking Lebanon, or defend Lebanese civilians. The question has to be asked - if the Army can't do that, what is it for? And even when 11 soldiers were killed near Beirut and 9 soldiers were killed near Tripoli, they were ordered to stay silent. Is Hizbollah the real Lebanese army? A lot of people have been asking what they can do to help end the war in Lebanon. If you have a blog - repost our Syrian Bloggers statement. Also, feel free to repost any facts, pictures or comments you see on this blog (just put a link back to this site), just like Olfy has done. When you are reading emails from Lebanon, or talking to family and friends - let Human Rights Watch and Amnesty International know about any war crimes if you come across evidence. They do listen. Go to one of the candlelit vigils around the world. Let me know of any that are happening, and I will post details here straight away. There is a very good list of demonstrations across the world here. It may not be much, but it's the least we can do. Demonstration Tuesday 18th at 9pm to 10:30pm. Parliament Square. Let's do something to stop this destruction of Lebanon. 100,000 people, including 75,000 foreigners, have fled to Syria to escape the war in Lebanon. Israeli Major General Moshe Kaplinsky: "The fighting in Lebanon will end within a few weeks. We will not take months." Israeli airstrikes have hit ambulances in the Christian town of Zahle, a major town in eastern Lebanon. Where is Human Rights Watch now? Israel has atttacked an army base east of Beirut, in Jumhur. 10 Lebanese soldiers have been killed, 30 are injured. 9 members of the same family have been killed in an attack on a house in the southern village of Aitarun. After telling all one million residents of south Lebanon to get out, the Israeli Army has revealed plans to reoccupy the south. They plan to enforce a 'security zone' of half a mile wide along the border. It is a buffer zone, and it uses exactly the same language used to justify their decades long occupation of the south which only ended 6 years ago. Red Cross workers have discovered 9 bodies in a building in Saida - they were sheltering in the basement, trying to protect themselves from the attacks. The building was destroyed by an Israeli airstrike on Sunday. Another tragic story of innocent Lebanese trying in vain to save themselves from the murder falling from the air. If there is one Israeli pilot reading this post - do not press the button. Airstrikes have killed 12 civilians in a minibus between Beirut and Saida, in the village of Rmeileh. Again, Israel has attacked a group of refugees with pinpoint accuracy. The minibus was taking civilians out of the south, just as the Israeli Army demanded. Has Human Rights Watch been reading the Syria News Wire? Israeli jets have attacked a van driving AWAY from the border area. Ten civilians dead, many more injured. There seems to be a clear attempt to injure people trying to escape the danger areas. There is no escape by sea or air, and the land borders are blocked. I hope Amnesty and Human Rights Watch are taking note. The Israeli Army has issued an incredible warning to the millions of Lebanese in the south of the country: GET OUT. They gave people two hours to leave or face the consequences. Anyone remaining would pay the price, and civilian casualties would not be the Israelis' fault. But leaving is difficult - as the Israelis well know. They have bombed roads, bridges and petrol stations across the south specifically to STOP people leaving. Getting out - let alone getting out in two hours - is almost impossible. Even in normal conditions driving from the south to the centre would take about two hours. Israeli Brigadier General Udi Adam: "We have now released a warning, an alert to Lebanon, to the residents of south Lebanon, that in two hours we recommend they leave their homes in some of the areas and move north because within a few hours we are going to attack that area, using all our military means." On Saturday, a number of families fled the southern Lebanese village of Marwahin after the Israel Defense Forces (IDF) warned them to evacuate ahead of a threatened attack. On the road leading to the coast through Chamaa, however, Israeli missiles struck a convoy of the civilians. Maps of southern Lebanon show this road to be the only direct route for escaping the dangerous border area. Having warned civilians to evacuate their village, Israeli forces should have been aware that civilians would be using this road and should have taken great care to avoid harming them. Muhammad Musa Ghannam, his wife Suha, and their children: Qassim, Mustapha, Hussain, Zaynab, Da`a’, Amina `Ali Ghannam. While I am glad they've taken notice of this atrocity, a quick skim through the posts on here will show that many more civilians have been attacked, and civilian infrastructure has been targeted. Yesterday a Lebanese Army base was struck killing 9 Lebanese soldiers. And Israel claims its war is with Hizbollah. A UN team sent to Lebanon to see the devastation are supporting the Lebanese government's call for a ceasefire. They've also called for the release of the two Israeli soldiers. They've hit the town of Afula, 30 miles south of the border, close to the West Bank. Syria has sent non-military supplies to help battered Lebanon. And it has cancelled port and airport fees for foreign aid coming in to Syria which is on its way to Lebanon. These are the places that have been attacked today and yesterday. In a private conversation with George Bush secretly recorded at the G8, Tony Blair has revealed that he is willing to go to the region 'to talk'. And that happened as they discussed Syria. 215 people have died in Lebanon and 24 in Israel. Israel says it wants to end its war on Lebanon within two weeks. The attacks of 1996 lasted 16 days. 10 people have died crossing a bridge when Israeli jets blew it up. Elsewhere 17 people were killed in attacks. An Israeli jet has been shot down over Lebanon. Lebanese TV have shown the pictures, but Israel has not confirmed it. 197 dead - nearly all civilians. Israeli troops have crossed the border into Lebanon for the first time. They destroyed some Hizbollah equipment and crossed back into Israel. US Secretary of State Condoleezza Rice says she's concerned about the civilian casualties in Lebanon - almost all of the 165 deaths are civilians. UN Secretary General Kofi Annan and UK Prime Minister Tony Blair have called for a UN peace force to be sent to Lebanon. They say it will stop Hizbollah's attacks on Israel which have killed 12 people. No word yet on whether they want an Israel peace force to be sent to Israel which has killed 165 people in Lebanon. European Union foreign policy chief Javier Solana has arrived in Beirut. He'll meet Lebanese Prime Minister Fouad Siniora. Syria has promised a "harsh and direct response" if Israel attacks it. Yesterday Iran threatened retaliation if Israel hit Syria. Israel attacked the border post - and both Syria and Israel were very quick to say that nothing landed in Syrian territory. It is clear that neither Syria or Israel want this crisis to spread. Israel has attacked two Lebanese army bases, in its clearest demonstration that its war isn't with Hizbollah. A building housing rescue workers has been hit in Tyre, killing 16 people. Syria has removed its requirement for foreigners to have visas to enter the country. Border guards are allowing anyone in, to escape the violence in Lebanon. Nine Lebanese Army soldiers killed at strikes on two army bases north of Tripoli. A house has been destroyed in Aitaroun in the south of Lebanon - 10 people, including 8 canadians are dead. 120 dead in Lebanon - nearly all civilians. 12 dead in Israel. Lebanon's second city Tripoli has just been attacked (it's predominantely a Sunni city - as opposed to the Shia Hizbollah). And also in the last few minutes, the historic town of Baalbek in the Bekka valley has been hit. Baalbek is a Hizbollah/Christian area. The city sky has been lit up yellow and blue again, with smoke pouring into the air. The low clouds make it difficult to know when an attack is coming. Attacks on the power station and more destruction to the airport have killed 10 people tonight. A Hizbollah rocket has hit Haifa in Israel, killing 8 people. It comes after the most intense night of bombing on Beirut from Israeli planes and ships. In the past few hours every part of Lebanon has been targeted. 17,000 Lebanese refugees have fled into Syria in the past four days. But getting out of Lebanon has become increasingly difficult. Israel has already blocked the borders and destroyed the airport. And now very few drivers are willing to take their taxis on to the roads. The price of a journey from Beirut to Damascus is normally SP 500 for a seat ($10). That has rocketed to SP 5000 ($50). And the journey takes six hours instead of the usual two and a half. Israel's Prime Minister Ehud Olmert has promised that he'll allow UN peacekeepers to move some Lebanese villagers living near the border away from Israeli attacks. Israel's Northern Command previously warned the UN to stay at least 5 miles away from the border. The UN called that demand "impossible to comply with, unacceptable". The villagers will be moved today if there is a gap in Israeli bombardments. But it'll be difficult for them to go anywhere - all of the key roads, bridges and petrol stations in the south have been bombed, and there is no way out of the country. And there's no guarantee they'll be safe in the hands of the UN. In 1996, Israel deliberately targeted a UN bomb shelter in southern Lebanon as hundreds of women and children took shelter. The US has stopped the Security Council from calling for a ceasefire between Lebanon and Israel. Every other country supported the peace move. The Lebanese government is shocked that the US has turned its back on them. They were our ally, they said, but "when it comes to Israel, it seems things changed." Israeli special forces in Lebanon? There are claims a team of special forces have entered Lebanon. They've been sent to track down and kill Hizbollah leader Sheikh Hassan Nasrallah. One hundred Iraqi Shias have been demonstrating in the Southern Damascus suburb of Sayida Zainab. They were waving Hizbollah flags. Hizbollah is a Shia group, and many of the southern parts of Beirut that have been targeted by Israel are populated by Lebanese Shias. 103 dead - 99 of them are civilians. Downtown Beirut has been hit by Israel for the first time. And the southern suburbs of the capital have come under the fiercest bombardment they've seen. 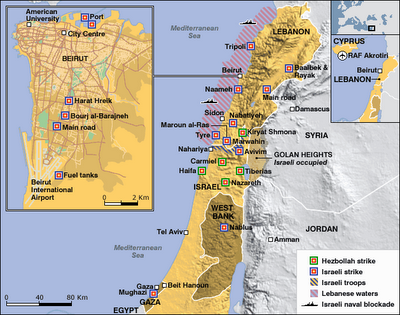 Israel has sealed Lebanon's borders. All of the land border crossings points into Syria have been bombed - in the north, and in the east. The ports have been blockaded in the west. And the airport has been destroyed in Beirut. There's no way out and no way in. Many countries are sending warships to Lebanon to get their citizens out. Movement INSIDE Lebanon has been heavily restricted too...roads, bridges and petrol stations have all been attacked, meaning civilians are being held hostage to Israel's almost continuous air raids. Syrian President Bashar Al-Assad has told the Lebanese government that he will put Syria's resources at the disposal of Lebanon. HMS Illustrious and Bulwark are both heading towards Lebanon. There are around ten thousand British citizens trapped inside the country - it's thought the ships will help them escape. Illustrious is one of the UK's biggest vessels. Iraq's US backed government has condemned the Israeli raids on Lebanon, calling them "criminal". The EU says the Israeli attacks are "disproportionate". Lebanon's Prime Minister Fouad Siniora has offered Israel a ceasefire - he was said to be so emotional that his voice was cracking as he made the announcement. Israel has imposed three conditions: the two soldiers are released, the rocket attacks stop, and Hizbollah is disarmed. Border post bombed, Israel says raid is on Lebanon, not Syria. More attacks on the capital - the streets resemble a ghost town tonight. A number of key roads and bridges have been destroyed in south Lebanon. Israel has blocked routes out of the south, trapping civilians in the border areas. Earlier they warned residents to leave - now, it's clear they can't. They say the UN has refused them shelter. In 1996, a group of women and children were in a UN bomb shelter which was targetted by the Israeli Grapes of Wrath attack. They claimed militants were hiding there - none were found. 3 civilians have been killed in the village of Hermel near the border. Syria says no Israeli bombs have landed on its side of the divide. The historic town of Baalbek has been hit by Israeli jets. The town is a curious Hizbollah stronghold in a largly Christian region of the Bekka Valley. 79 people dead, almost all civilians. 250 wounded. And an update on the attack on the villagers fleeing a border village - 15 have now died. Israel has continued its attacks on Lebanon's borders, in an attempt to trap Lebanese inside the country. They've already blockaded the sea ports, destroyed the airport and bombed the Beirut-Damascus highway. Now, they've attacked the only road out of Northern Lebanon into Syria. And they've attacked bridges in the mountains of North Eastern Lebanon. There are very few ways for people to leave Lebanon. France says it is ready to lay on military planes to pull out the estimated 19,000 French civilians stranded in Lebanon. Israel has hit Northern Lebanon for the first time. Hizbollah has hit Tiberias, which is 35km inside Israel. Israeli TV says they've found the body of one of the Israeli sailors missing after the attack on their ship which had invaded the waters off Beirut. Three more are still missing. French President Jacques Chirac: it looks like Israel has a "wish to destroy Lebanon," by attacking its civilian infrastructure: power stations, bridges, roads - in addition to its blockade of sea ports, destruction of the airport, and damage to the main land route out of the country. Death toll: 73, "almost all civilians" (An-Nahar, Lebanon). 72 civilians killed, 1 Hizbollah fighter killed. Israel has bombed a road in Zahrani, hitting an ambulance. Israel says 4 of its sailors are 'missing' after an attack on one of its ships which invaded the water around Beirut. Excellent primary reporting of the attacks on Lebanon, and their coverage in the media here. The New York Times printed this picture with this caption today: "Israel used 155-millimeter shells against Hezbollah in southern Lebanon." Against Hezbollah? There are no fixed positions for Hezbollah in South Lebanon. Also, the Times said this: "Mr. Bush placed the blame for the tensions squarely on Syria for housing leaders of Hezbollah." I mean, if this is considered the most serious newspaper in the US, what do you expect from the rest? There are of course NO Hizbullah leaders in Syria. They all are in Lebanon. This is what happens when they let Hassan Fattah covers Lebanese events. In his article today, he said this: "But few Israeli officials seem to think that the Lebanese government, which is greatly influenced by Syria". I mean, does anybody other than Hassan Fattah think that the Hariri government of Lebanon, which all but declared war on Syria and which is greatly influenced by France and US, is "greatly influenced by Syria?". 66 killed, "nearly all civilians" (Agence France Press). After originally saying there were nothing more than a few scratches on the Israeli war ship atttacking Lebanon from just outside Beirut, Israel has admitted that it has been seriously damaged. They say it is limping back into an Israeli port. Reports suggest it was the country's most sophisticated vessel. It's not clear how many Israeli sailors have been killed. Hizbollah has attacked an Israeli ship from positions in Beirut. The Lebanese Army is firing at invading Lebanese jets, in a sign that the militia and the army are working towards the same aim for the first time in decades. 17,000 Lebanese have flooded through the Masnaa border crossing on the main Beirut-Damascus highway today. Israel bombed the main highway, so many have had to find back routes. Thousands of foreigners have also been fleeing into Damascus. Beirut, and the Lebanese mountains are popular holiday destinations for Gulf Arabs. French President Jacques Chirac: Israel's war on Lebanon is "completely disproportionate". Vatican spokesman: it is an attack on a sovereign and free nation. Walid Jumblatt (anti-Syrian Druze leader in Lebanon): says he is standing by Hizbollah. Saudi Arabia has condemned Hizbollah. The United States: John Bolton, US Ambassador to the UN says 'we have asked state sponsors of terrorism to stop their attacks'. No, he's not talking about Israeli bombing of civilians in Lebanon. He's talking about Syria. Israeli Prime Minister Ehud Olmert has upped the stakes, saying he will consider a ceasefire if the two soldiers are returned AND Hizbollah disarms. Israel has blocked Lebanon's sea ports. It has destroyed Beirut Airport. And now it has put a hole in the Beirut-Damascus highway. By land, sea and air, it's now almost impossible for Lebanese to escape the country - but Israel is continuing to air bomb the country. 60 are dead so far. Israel has warned the Lebanese authorities to evacuate an entire suburb of Beirut where Hassan Nasrallah (the leader of Hizbollah) is thought to live. With the borders blocked, and authorities stretched to the limit, it might be very difficult for any of these poorest of Lebanese to escape. While the attacks continue, the Syria News Wire will be posting updates as soon as they come in, so expect some very short, one line posts, as well as the usual regular news review. And there will be an update on the death toll with the Lebanon Body Count posts. - 27 civilians have been killed in dozens of airstrikes across Lebanon. There were 40 air bombs, mainly in southern Lebanon and the outskirts of Beirut. 10 of the victims were children. 10 of the people killed came from the same family in the village of Dweir. - Beirut International Airport's been closed after Israeli jets attacked the terminal building and destroyed the runway. It's the country's only international airport. - The ports have also been bombarded, meaning there is no way into or out of the country - except the Syrian land borders on the other side of the mountains. - Israeli soldiers have entered Lebanon for the first time since the occupation ended in 2000. - And Al-Manar TV, which revealed the Israeli soldiers had been captured before the Israeli army wanted the information made public, has also been attacked. It comes a day after 2 Israeli soldiers were captured in an attempt to release the thousands of Lebanese prisoners held in Israel jails for decades. Hizbollah has captured 2 Israeli soldiers on the border with Lebanon. Israel has confirmed that Israelis have been taken into Lebanon by Hizbollah - they wont say whether they are soldiers (that's usual procedure until the families have been told). 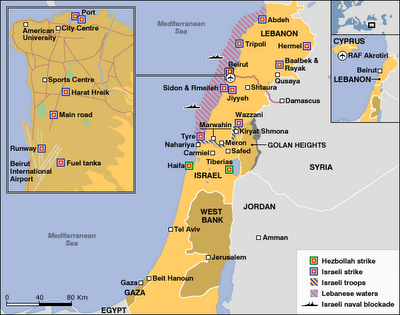 Israel has extensively bombed southern Lebanon, and there are reports ground troops are in the country. Israel says it holds the Lebanese government responsible - so it's likely they will quickly move on to bombing Beirut, and possibly Damascus in the coming days. Elias Hrawi, the 'other Hariri' has died at the age of 80 in a Beirut hospital. He - along with Rafiq Al-Hariri - led Lebanon out of civil war. 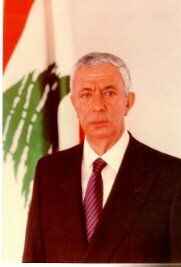 He was the country's head of state from 1989 to 1998, before Lahoud took over. His predecesor, Rene Mouwad, was in power for just two weeks before he was assasinated. It couldn't have looked good for Hrawi. But he stayed in the Ba'abda Palace for nine years, to become Lebanon's longest serving president. It was Hrawi who authorised Syrian military action to drive rival sel-proclaimed President Michel Aoun out of Beirut, ending the civil war. An excellent piece by George Ajjan exclusively for the Syria News Wire. George is a political writer based in New Jersey, originally from Aleppo. More on him here and his exciting project Syriapol here. Syrians have had a documented presence in the United States of America since its inception. In fact, a soldier named Nathan Badeen, who hailed from the Horan, fought with the American colonists to win their independence from the British crown during the Revolutionary War. A large wave of immigrants from Greater Syria began arriving on American shores in the late 19th century through the end of WW I, well before the borders of today's republics were drawn (and before there was any such thing as an Arab-Israeli conflict), identifying themselves as "Syrian". These include the famous poet Khalil Gibran (who addressed his poem I Believe in You to "Young Americans of Syrian origin") and the author Abraham Rihbany (who wrote The Syrian Christ). The well-respected St. Jude Children's Research Hospital raises money under the ALSAC umbrella, which stands for "American Lebanese Syrian Associated Charities". However, in more recent years, Syrian immigrants asssociate strongly with the Syrian Arab Republic and most retain their citizenship. The overwhelming majority, while aware of the regime's shortcomings, tend to reflexively defend it. This is probably due to the fact that most of these individuals have prospered in the US, and have been able to send enough money back to Syria so that their families live comfortably. The current situation works to their benefit and consequently they prefer stability in Syria above all else. They tend to be apolitical in general, although this trend is changing because Arab-Americans feel that their civil rights in the US have been eroded in the past 5 years. A handful have emigrated from Syria to the US for political reasons over the past few decades, and recently, these individuals have begun to organize exiled opposition groups, albeit with limited success. Many Syrians in the US, despite their gripes with the Syrian regime, tend to refrain from publicly stating their opposition, probably because they prefer to visit their home country without political baggage that will arouse government suspicion for themselves or their families. More speculation about Khaled Mish'aal. Has he left Syria or not? Where has he gone? Still no confirmation from the Syrian government or Hamas. In fact Hamas are denying it. And only Al-Arabeeyah and Israel's Channel 10 have touched it so far. No confirmation on the AFP/AP wires, or from Al Jazeera, which makes me sceptical. The latest claim is that Mish'aal is in Algeria. 'Syrian sources' being quoted on Al-Arabeeya say that Hamas leader in exile Khaled Mish'aal has left Damascus. It comes after Israeli pressure on Syria to force Hamas to release their captured soldier. Israeli warplanes flew over Bashar's Latakia palace last week. Just days ago Egypt told Syria to expel Hamas. Information from a 'senior source' says Mish'aal left three days ago. Hamas are denying the claims.